This summer, we’re celebrating heroes in our summer learning program along with many libraries across the US. It’s quite a fun theme because it incorporates superheroes and comics on the one hand while also providing a great backdrop on which to celebrate the hero within. Many of the books and ideas I plan to share this summer during storytime will encourage kids to do great things. This week was no different. I have been using letter cards at the beginning of storytime as a welcome activity to support letter recognition, to get kids physically stretching, and to break the ice, so to speak. My pack of letters has 26 cards (plus some duplicates) and each one has an uppercase letter and the picture of a child forming the shape of the letter with their body. I keep the cards in a bag and, one at a time, kids pull out the first card they touch. I hold it up so all can see and we say the letter’s name and then make the shape with our bodies. The cards include a diverse group of kids which I appreciate. This week I decided to only have the letters that spell AIRPLANE in the bag. After we played the game, I organized the letters into the word as a hint for the storytime theme. I was glad that I simplified things because kids kept pouring into the room and I never would have had enough letter cards for everyone to pick a letter. Frankly, we would have been there all day playing just this one game if we went through the entire alphabet. During some storytimes in the Winter I can get away with every child who arrives at the start picking a letter because the crowds are smaller, but not in the Summer. Once everyone was settled down on their storytime mat (with a little help from the song If You’re ready for a Story), it was time to read. She is recognized as a hero when she rescues a group of boy scouts stranded in a river instead of competing in the airplane competition she was headed to when she discovered them. The book also gave me a great opportunity to talk about flight and gravity, the focus of this storytime. Too technical for storytime and the 3-7 year olds who attend, you say? No way! 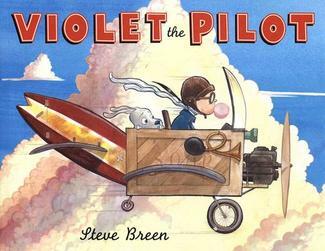 I infuse STEAM in my storytimes every week and have found that breaking down big concepts, like flight or electricity, into bite size pieces can work. Kids may not be ready for rocket science, but everyone starts somewhere. Why not at the library storytime? We do that with reading, why not with science, technology, engineering, art and math? Before I shared this book, I asked the group what we needed to fly. I was delighted when a girl said “lift and thrust.” The adults were blown away! Over the course of storytime I explained the ideas and what parts of a plane handle lift and thrust using the two books I read, the books’ illustrations and the experiments we did in the second half of storytime. One thing I would do differently if I wrote this book is make sure the boy scouts are wearing life jackets in the rescue illustration. Drowning is a significant problem in Alaska (many families spent a lot of time on the water) and we are always driving home the idea that everyone needs to wear a life jacket when they are on a boat or dock (young kids). I took a moment to talk about life jackets when we got to that part of the story, but it would be nice to have the book model this important practice. Kids were wiggly by the time I was finished with Violet’s story, perhaps in part to the large number of people, so we got moving. I had my phone and a portable speaker on hand with the storytime playlist ready to go. I also had my collection of shakers to use with Laurie Berkner’s The Airplane Song. I actually ran out of shakers for the first time ever, but the kids without them handled it well. The song is full of action and the movements work with or without shakers. 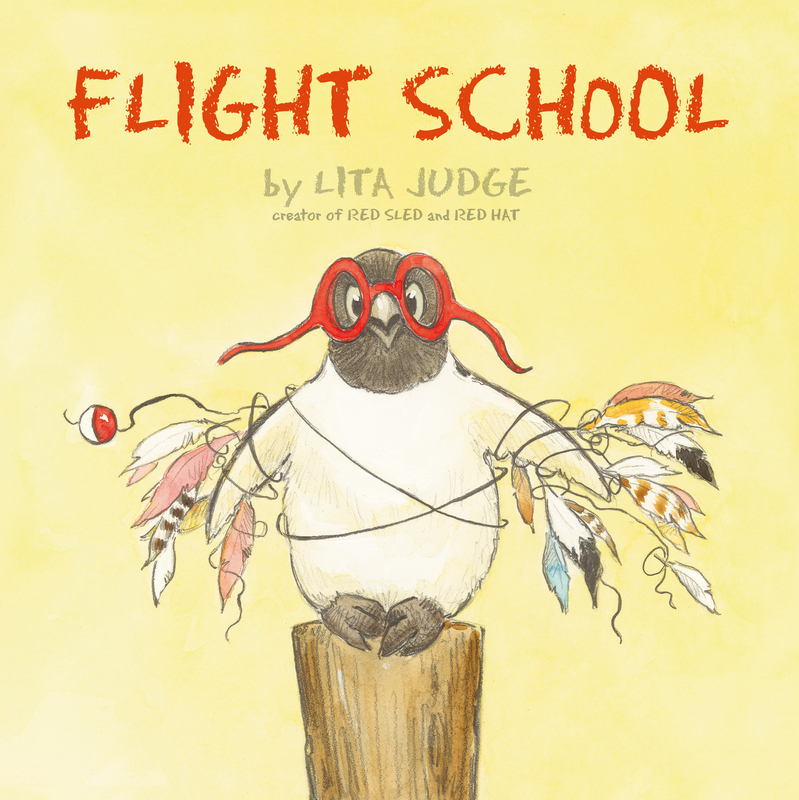 We then read Flight School by Lita Judge (Atheneum Books for Young Readers (2014). It’s the story of a penguin who desperately wants to fly, but can’t so he goes to flight school. While his body is meant for swimming and he can’t get airborne on his own, the other students get him off the ground, demonstrating heroism on a smaller scale and helping penguin fulfill a lifelong dream. Time for experiments! I like to refer to this storytime as Physics for Preschoolers. Boy, did I miss my summer assistant this week! With three stations going and over 60 people, I could have used an extra hand. She is on vacation so we made do without her…just barely. Designing multiple stations lets me offer a variety of activities and most kids will find at least one that appeals to them. It also helps to spread out the crowd a bit. I love painting during storytime. I can handle the mess and so can the families who come. Kids know to wash their hands as soon as they are done at the painting tables (there is a sink in the kids’ room) and caregivers often help clean up. I make t-shirts available, but they never get used. I stick with washable tempura paints to make things easy. Gravity painting was an easy leap for me. I modified a project I found at the Artful Parent, a great place to find ideas that can be adapted for storytime. Before storytime, I built 12 stands for this activity. I used aluminum trays I have stored away and book ends. I taped the back of the tray to the book end to keep them upright. 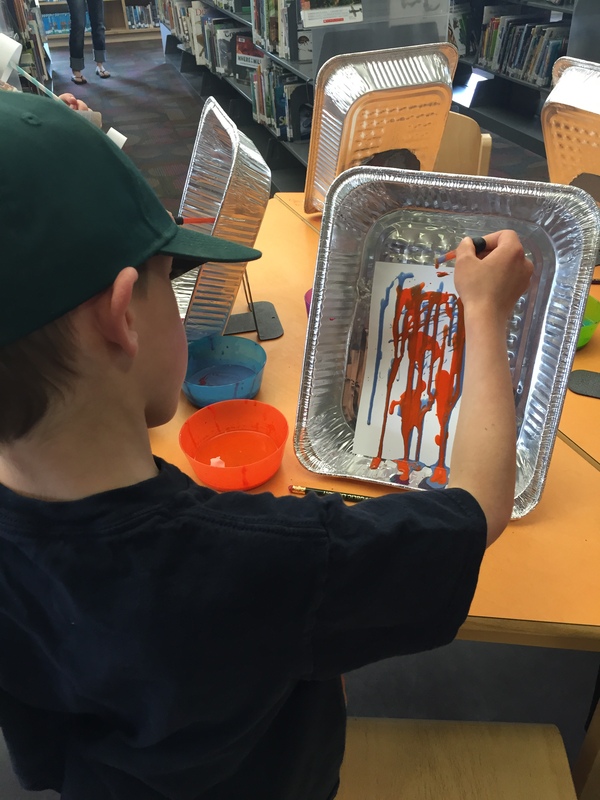 To paint, kids used eyedroppers to suction watered down tempura paint out of bowls on the tables and then squeezed it on to the 1/2 sheet of cardstock paper in the upright tray. 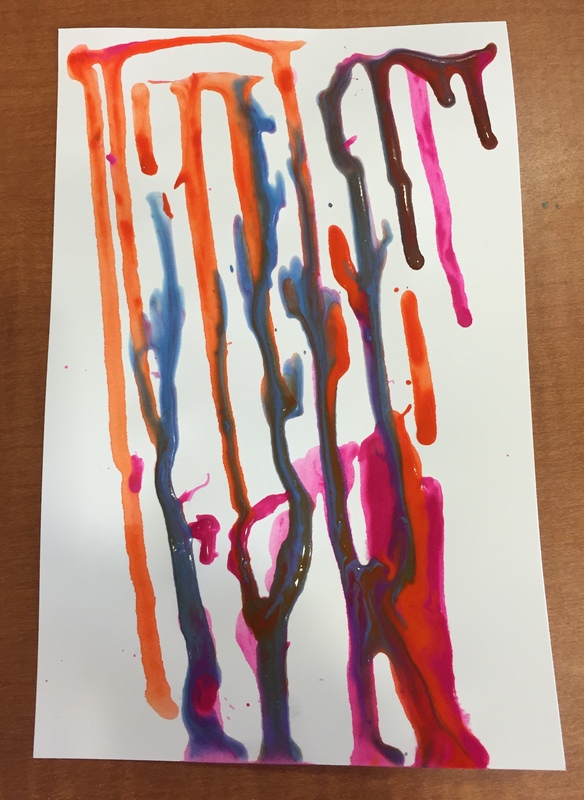 The paint slides down the paper, thanks to gravity, and creates beautiful designs. Some families taped the paper in the tray until painting was complete. We talked about gravity in a very basic sense, remembering again, that we’re introducing big ideas in bite sized pieces. We’ve made these airplanes at the library before and I love them. They seem ridiculous, but always fly. I got the idea from the DIY Network. 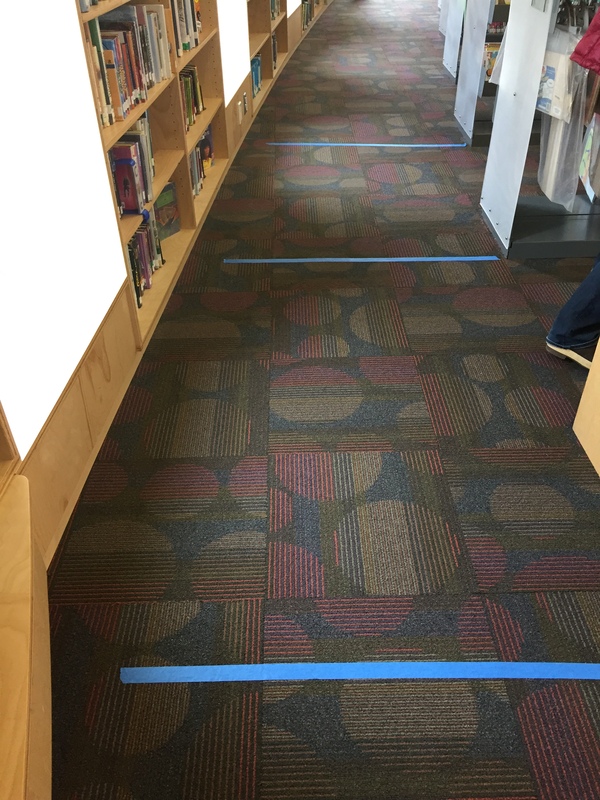 The materials are minimal and I have a nice spot for creating an airstrip where kids can measure how far their play goes and practice throwing the plane. Some kids ended up adding wings and other decorative pieces and then tried to fly them again. Pretty cool. I spent the most time at this station since it it was the least self-explanatory. I used a similar experiment at a Maker Monday: Forces of Flight program for older kids last summer and thought it would be fun to show the younger kids. it was a hit! 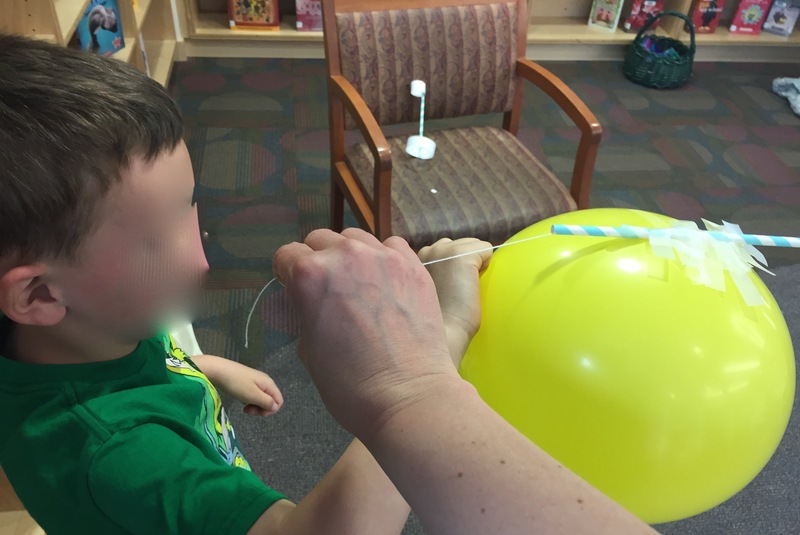 The idea is that a blown up balloon provides the thrust to push the straw it is attached to along a string. One end of the string is tied to a chair and I held the other end. Kids or adults blew up balloons and we taped them to the straw. I talked to them about Isaac Newton’s 3rd Law of Motion and explained that the air escaping the inflated, but untied balloon would cause the balloon to go in the opposite direction. This helped them position the balloon with the tail towards me and the round, or top part of the balloon, int he direction they wanted it to go- towards the chair. I held the one end of the string so we could see if holding the string up higher or lower changed the speed at which the balloon and start traveled. Many kids tried this experiment over and over. Here is the balloon airplane in action. 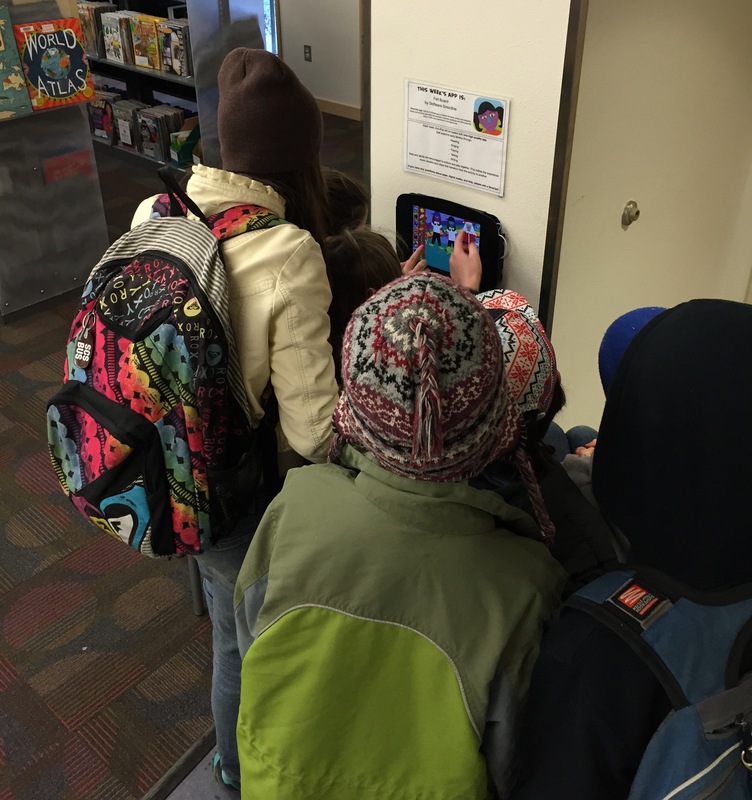 Just last week, we finally made an iPad available for use in our modest-sized, but busy, children’s library! I’ve been using iPads in programs for almost two years now, but this is the first time we’ve had one for families to use anytime. The first week has seen regular play by kids, mostly in pairs or groups. We’ll be adding another iPad to our Teen Space soon, but here are the ins and outs of managing our first mounted iPad. First of all, we chose the iPad, versus another device, for several reasons. We mounted the iPad horizontally on one of the few free walls in the space using a MacLocks Wall Mount. It is across the room from the desktop and AWE computers, and also on the other side of the children’s library from the space where families with young children most commonly sit and read together. It is, however, in clear site of the circulation desk through the windows that separate the children’s library. The iPad is actually nicely situated in amongst the stacks in a part of the space that needs a draw- the 900s, biographies, magazines and audiobooks- and the device may be another tool for broadening kids’ exploration. 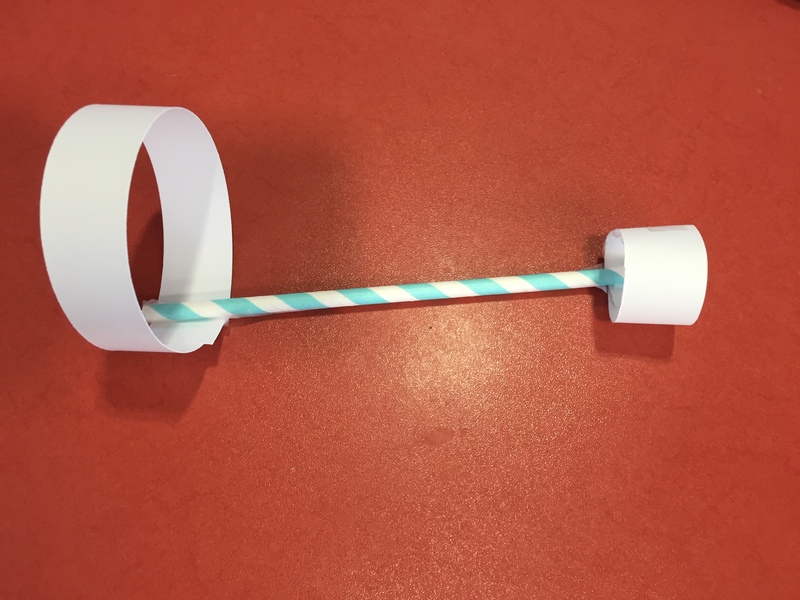 While kids may like these types of materials, the device is actually attracting them to a space they may not naturally gravitate towards when they visit the library. One unexpected wrinkle we’ve been dealing with is charging the iPad. There is an outlet located right below the iPad, but it’s difficult to plug the charging cable into the device while the iPad is in the mount, which we were hoping to do. Since we don’t want to open the mount every night to charge the device, we decided to tuck the cord into the mount and leave the small square piece that goes in the outlet out of reach until it gets charged at night. We’re hoping that works. Like other libraries we decided to offer one app at a time on the iPad. We don’t have the resources to switch out the app each day, but we are going to keep each app on the iPad for one week. The device is locked into the one app using Guided Access and prevents kids from accessing the settings or other content we want left alone. The one app method also has proven to help kids focus on the task at hand and self-regulate their digital media use. Once they are done exploring the app, they move on to another activity and allow other kids and families to have a turn. We don’t enforce time limits based on our experience with the AWE computers which targets a similar age group. Over time we found that AWE users rarely explored for more than 30 minutes and so we don’t feel the need to control their use. 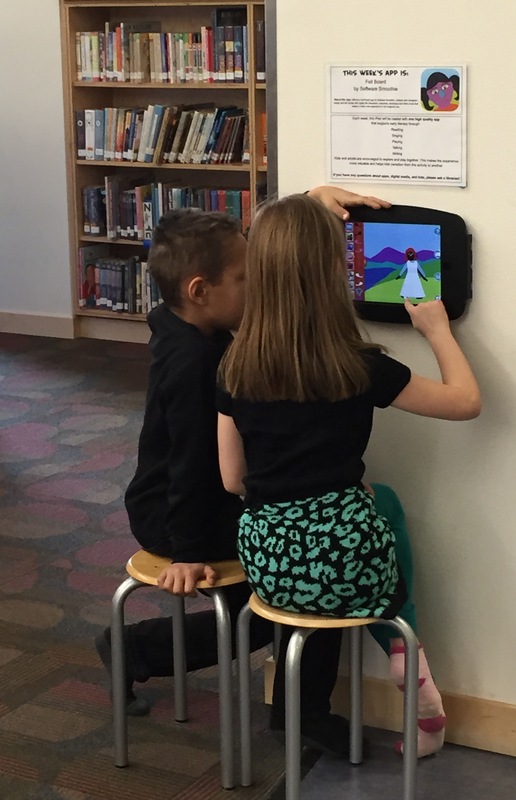 Because this iPad is in our children’s library, we have chosen to focus on apps, both toy and story, that support early literacy among kids under 9. Will older kids test out the apps and even enjoy them? I have no doubt. In fact a group of 10-12 year olds giggled away as they told each other stories with the iPad this past week. To select apps for the public iPad, in addition to apps I share in programs, I use the rubric I mentioned in an early post. The first app I added to the iPad was Software Smoothie’s Felt Board. It’s one of my favorites and it doesn’t use sound. While sound isn’t a deciding factor in what apps we’ll feature, we didn’t want to add much more background noise to the children’s library. It’s a non-shushing space, but after school the volume gets pretty loud with just a conversational level because of the number of people. 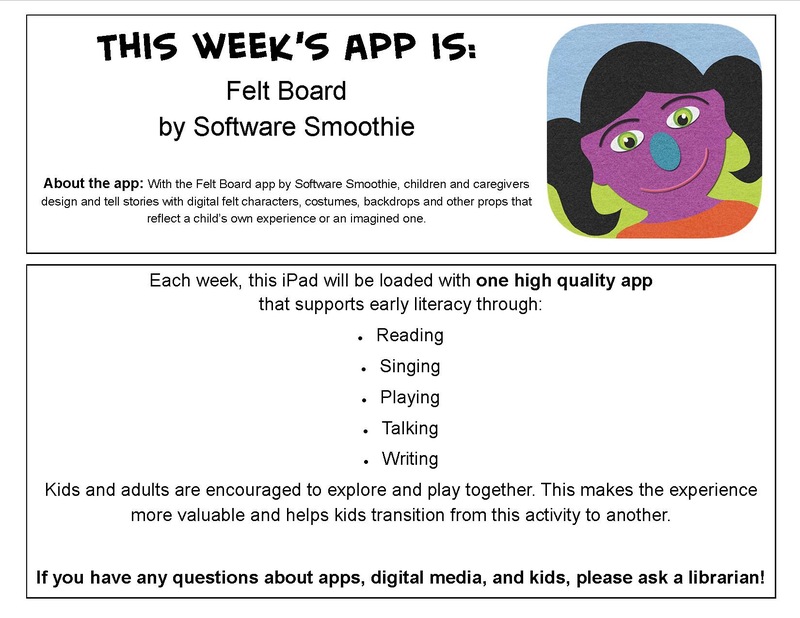 Every week I also add the App of the Week to my library’s Pinterest App of the Week board so family’s can find the apps we’ve previously recommended. Toca Kitchen 2 let’s kids play with pretend food and imaginary guests who respond to meals in silly, and sometimes surprising, ways. This is a toy, not a game with points, coins, or levels, and kids will delight in the freedom to create digital concoctions from the array of whole food items found in the kitchen’s fridge. Food can then be prepped, cooked, or juiced and fed to one of three culturally diverse guests (a woman, a man or a kitchen monster). The mostly wordless app supports multi-touch and is easily enjoyed by friends or family members playing together. The app is free of 3rd party ads, links and in-app purchases. Toca Kitchen 2 is currently only available on iOS. The special launch price is $.99. The app is great for ages 3-6, but older kids (and adults) may enjoy playing along also! Over the past year and a half, I have been working on a rubric for evaluating apps and new media for young children. I wanted something for my own purposes, to use when reviewing apps for program use or to recommend to families, as well as something to share with other librarians and educators. I’ve have finally come up with something that works for me. Take a look and try it out on the next app you evaluate. The rubric, and other helpful information for evaluating new media, is included in a chapter of Little eLit’s book, Young Children, New Media, and Libraries: A Guide for Incorporating New Media into Library Collections, Services, and Programs for Families and Children Ages 0-5. I am humbly writing the chapter with the talented Carisa Kluver of Digital Storytime. The book chapters are being published individually each month at Little eLit, so stop over and read what my smart librarian friends have to say. Thanks to many for their conversations about what makes new media high quality, but in particular, the belated Eliza Dresang, as well as Cen Campbell and Carisa Kluver. Thanks also to those who review apps and new media. We are reading those insights with great interest. Keep reviewing and keep sharing! I often get asked about my favorite apps, so here is a quick list of my current favorites! Where noted, I have used the app in storytime, otherwise the app is one I have recommended to families and caregivers for use with small groups or one on one. I use an iPad so these are all iOS apps, although they may be available for Android and Windows devices. Note: Almost all of my storytimes are held in places with no monitor or other way to mirror apps from my iPad (at the library or in outreach programs). New media workshops or digital storytimes are held in our library’s meeting room where there is a monitor mounted on the wall, but it is not big enough for our regular storytime groups. When I use apps in storytime, I am almost always using them on a tablet size screen…for now! Hopefully the technology fairy will bring our library a monitor and some iPads one of these days. If you know her, send her my way! I’ll post another list soon which will include apps I’ll tell families about during the Fizz, Boom, READ and Spark a Reaction summer reading programs at our library this summer.